Modern humans evolved over the past seven million years from ape-like ancestors who were the earliest members of our lineage. The way in which we learn about the evolution of our species and the diets of our ancestors has been radically transformed by new fossil discoveries, chemical analysis of ancient teeth and genetic analysis of DNA. The term hominoid refers to members of the superfamily Hominoidea, both present and past which comprises humans, the gibbons, and the great apes (orangutan, chimpanzee, and gorilla). Modern humans and their ancestors are referred to as either hominids or hominins, but hominin is the preferred term. Human evolution has been influenced by mutations, natural selection, migration and genetic drift which happens when the frequency of gene variants (alleles) change due to random sampling. Archaeologists study human history using knowledge of chemistry, geology and other cross-disciplinary fields. The hominid fossils discovered by archeologists are carefully studied by paleoanthropologists who try to determine how the fossils fit in the evolutionary tree of modern humans. Many of the fossils are incomplete and their age may not be easily determined. For this reason, the classifications of early hominids and the time at which they lived may not be precise. 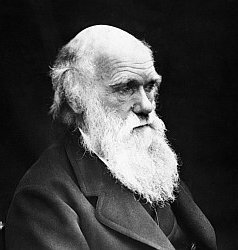 Analysis of DNA from fossilized and living hominoids has provided support for the theory of evolution which was first proposed by Charles Darwin in his book The Origin of Species , published in 1859. The theory of evolution is rejected by people who believe in intelligent design and creationism. 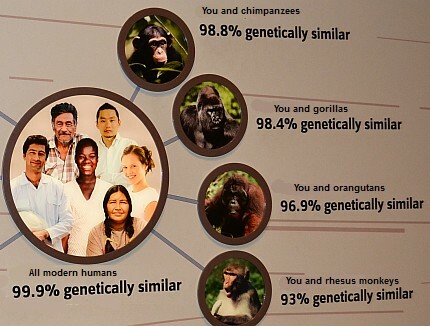 However, comparison of DNA indicates that modern humans are closely related to chimpanzees and bonobos and more distantly related to gorillas. The following is a list of hominids representing different stages of development toward modern human features. 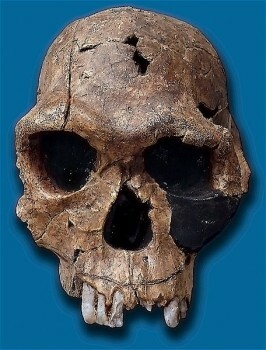 Sahelanthropus tchadensis lived about 7 million years ago at about the time when chimpanzees and humans diverged. The braincase of S. tchadensis had a volume of only 320 cc to 380 cc which is similar to that of modern chimpanzees. The name Sahelanthropus is derived from Sahel which is the area of Africa near the southern Sahara where the fossils were found and anthropus from the Greek word meaning "man". 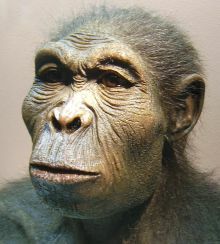 The scientific community has not reached a consensus that S. tchadensis is a human ancestor. Orrorin tugenensis lived between 6.2 and 5.8 million years ago. This hominoid was approximately the size of a chimpanzee and had small teeth with thick enamel like those of modern humans. The structure of the femur suggests that Orrorin was bipedal. The name Orrorin means "original man" in the Tugen language of	West Central Kenya. Ardipithecus ramidus was an ancient hominid that had a grasping big toe adapted for locomotion in the trees and long arms which could be used for climbing. Ardipithecus had small canine teeth like later hominids. Its brain case had a volume between 300 and 350 cc. The name Ardipithecus is constructed from the word ardi meaning "ground" or "floor" in the Afar language of Ethiopia, and the Greek suffix -pithecus for "ape". A fossil of A. ramidus was dated to 4.4 million years ago on the basis of its stratigraphic position between two layers of volcanic ash. Australopithecus and Paranthropus were early hominins that lived from about 4.0 to 1.8 million years ago. The later individuals lived at the same time as Homo erectus and Homo habilis. Footprints of bipedal hominins made 3.6 million years ago are fossilized in volcanic ash at the site of Laetoli in Tanzania. Paleoanthropologists disagree on the assignment of the genus Australopithecus, meaning southern ape, and the genus Paranthropus based on the Greek words, para meaning "beside" or "near" and anthropus meaning "man". Consequently, existing fossils are organized under both categories. Australopithecus afarensis lived in Eastern Africa between 3.9 and 2.9 million years ago. The most famous fossil nicknamed Lucy (3.2 million years old) was found in the Afar Triangle region of Hadar, Ethiopia in 1974. A. afarensis had a slender body, walked upright and had hands very similar to humans. It did not have a grasping toe, so it was a ground dweller. 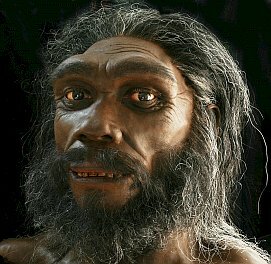 It is thought that A. afarensis was closely related to the genus Homo which includes modern man. During the Pleistocene epoch there were several episodes of global cooling, or ice ages. Many temperate zones were covered by glaciers during cool periods and uncovered during the warmer periods when the glaciers retreated. The Pleistocene was characterized by large land mammals similar to modern species, such as mammoths and mastodons, longhorned bison, saber-toothed cats and giant ground sloths. Many plants of the Pleistocene still survive today, and it was during this epoch that humans first appeared. 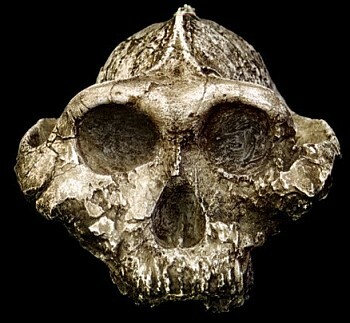 Paranthropus boisei or Australopithecus boisei was the largest of the Paranthropus genus (robust australopithecines). It lived in Eastern Africa during the Pleistocene epoch from about 2.3 until about 1.2 million years ago. Its brain volume of about 500 to 550 cc was almost double that of Ardipithecus. Members of the genus Paranthropus are also called robust australopithecines because they have robust skulls, mandibles with large teeth, and gorilla-like sagittal cranial crests that anchored strong muscles for chewing. Starting around 2.5 million years ago hominins used primitive stone tools and produced flaked blades. 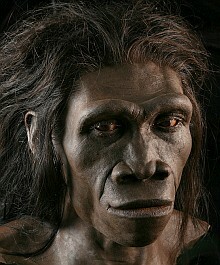 Australopithecus sediba lived during the early Pleistocene about 2 million years ago. 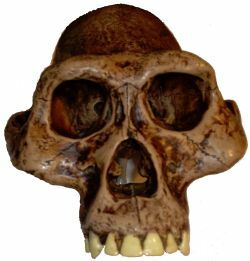 The first specimen of A. sediba was found by Matthew Berger, the nine-year-old son of paleoanthropologist Lee Berger in 2008 at the Malapa Nature Reserve in South Africa. 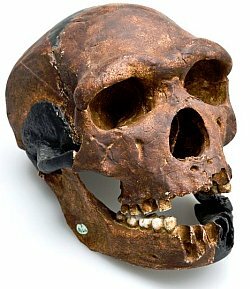 The skull of Australopithecus sediba has relatively small premolars and molars, and facial features that are more similar to those in Homo. However, other parts of the skeleton are similar to that of other australopithecines with long upper limbs and a cranial capacity of around 420 to 450 cc. Homo habilis (skillful man), the oldest member of the genus Homo, lived from about 2.4 to 1.4 million years ago in East Africa. Its brain volume ranged from 550 to 687 cc, which is about one third the size of modern human brains. Homo habilis had longer arms compared to modern humans, but its face was less protruding than the australopithecines. Its classification as Homo has been controversial since its proposal in the 1960s. Homo habilis sites have been associated with butchered animal bones and simple stone tools which has helped to establish that hominins started routinely hunting for meat between 1.8 and 1.6 million years ago. H. habilis and H. erectus coexisted in Africa for a period of 500,000 years. Homo erectus (upright man), sometimes called Homo ergaster (working man), lived from about 1.8 million to 500,000 years ago. 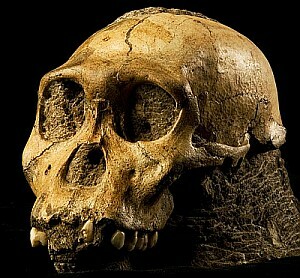 The first fossils of Homo erectus were found in 1991 at Dmanisi, Georgia, but other fossils of H. erectus have been found throughout Africa and Eurasia. 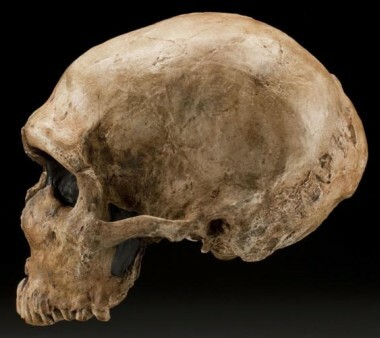 Homo erectus had an elongated skull and a slanted forehead with a brain case of about 600 cc. The skull had a pronounced, thick brow ridge, a thickened temporal band, as well as a bar of bone at the back of skull. The teeth and body size were similar to modern humans. H. erectus did not have the forelimb adaptations for climbing seen in Australopithecus. Its global expansion suggests that H. erectus had the cognitive capacity to adapt to different environments. During its long existence, H. erectus experienced a major increase in brain size which is thought to have come about by a change to a high-calorie meat-rich diet that was later enhanced by cooking approximately 790,000 years ago. Some Asian specimens of H. erectus have a brain capacity of up to 1,250 cc and smaller molars that had adapted to a softer, richer diet. H. erectus had characteristics that differed by region; specimens from China (Peking man) have a very pronounced brow ridge, whereas those of Java (Java man) have a less pronounced brow ridge. Paleoanthropologists have suggested that the thickened skull bones in H. erectus evolved primarily as an anatomical adaptation to violence within the species. The fossil record has several instances of healed cranial fractures which indicate that head trauma may have been common. Homo heidelbergensis (Heidelberg man) lived from about 800,000 to about 300,000 years ago. 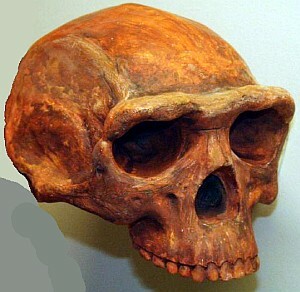 H. heidelbergensis is thought to be a direct descendant of H. erectus in Africa. H. heidelbergensis was a species very much like modern humans in terms of body proportions, dental structure, and cognitive ability. The brow ridge of H. heidelbergensis was less pronounced than that of H. erectus. He was an active big-game hunter who used sophisticated tools and learned to control fire. The fact that H. heidelbergensis had a hyoid bone as an anchoring structure for the tongue indicates that he was capable of speech. Deposits of spear points in 500,000-year-old deposits at Kathu Pan in South Africa provide evidence that H. heidelbergensis was the earliest human ancestor to use stone-tipped spears. It is thought that sometime before 500,000 years ago in Africa, H. heidelbergensis was a progenitor of the Neandertals and the Denisova hominins. While the ancestor of modern humans stayed in Africa, the common ancestor of Neandertals and Denisovans migrated out. The Neandertal lineage moved west into Europe and the Denisovans spread east, populating large parts of Asia. Homo neanderthalensis (Neandertal man), also called Homo sapiens neanderthalensis, first appeared in Europe between 400,000 and 300,000 years ago. The Neandertal range expanded east into Asia from 100,000 to 60,000 years ago. The name Neandertal is derived from the Neander valley (tal in German) near Düsseldorf, Germany where the first specimen was discovered. Neandertals had an average cranial capacity of 1600 cc which was larger than the 1400 cc average for modern humans, and they were much stronger than modern humans, having particularly strong arms and hands. The Neandertal femurs were thick and curved to support very muscular legs. Neanderthal skulls had an oblong shape with a brow ridge, slanted forehead and a bulge in the back of the head called an occipital bun. Neandertals used tools made of flint and bone. They also had burial practices. Jean M. Auel's book The Clan of the Cave Bear provides an imaginative scenario of the life of the Neandertals during the ice age. Neandertals were the closest relatives of modern humans, and the two species interbred approximately 50,000 to 60,000 years ago. In their expansion to Asia, Neandertals also interbred with Denisovans. Neandertals disappeared from the fossil record approximately 30,000 to 40,000 years ago. Homo sapiens, modern humans, have lived from about 200,000 years ago to the present. 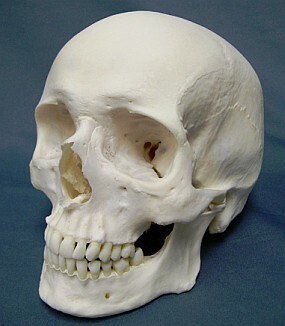 Human skulls have a high forehead without prominent brow ridges, and the shape of the head is round with the widest part toward the top of the head. Genetic analysis has revolutionized the knowledge about the origin of modern humans. The genomes of chimpanzees and humans are 99 percent identical in the small portion that carries instructions for making proteins, but only 96 percent identical in the much larger portion of the genome that does not contain protein-coding sequences. Genetic analysis also found that Neandertals contributed DNA to the human genome by interbreeding in Europe and Asia. People living today who trace their origin to Europe or Asia have an average of 2.5 percent Neandertal DNA. In addition, it has been found that approximately 5% of the DNA of modern Melanesians and Australian Aborigines derive from Denisovans, a race of Paleolithic-era members of a species of Homo that ranged from Siberia to Southeast Asia. Not much is known about the Denisovans because only some teeth and a small finger bone have been found, but scientists were able to extract the whole genome of the Denisovans from these small samples. Human mitochondrial DNA (mtDNA) is inherited only from the mother. Research published in 1987 showed that all living humans descended from one specific woman, who lived between 140,000 and 200,000 years ago in Africa. That woman has been nicknamed "Mitochondrial Eve." Learn about future human evolution. Cann RL, Stoneking M, Wilson AC (1987), "Mitochondrial DNA and human evolution", Nature 325 (6099): 31–36. Shreeve, J., The Case of the Missing Ancestor, National Geographic, July 2013, pp. 90-101.